"Downsizing is about saving yourself." Downsizing is nuts and not at all what you would expect. Somehow, filmmaker Alexander Payne makes the high concept comedic premise of shrinking oneself down (think Honey, I Shrunk the Kids) the most conventional part of his stealth activist dramedy. The bizarre, often baffling film tries to explore contemporary political and environmental issues through broad comedy and ultimately feels like an ambitious television miniseries edited down to a scattered 135-minute satirical film marketed as a typical Hollywood starring vehicle. Matt Damon (for some reason) stars as a Matt Damon type, Paul Safranek (cue jokes about how to pronounce his name), who is a nice, well-meaning Nebraskan man. He wants more from his small life and decides to get more by literally going small. The first hour is largely (and only sometimes comically) about the eponymous process of being shrunk down to live in one of many manufactured miniature wealthy communities. Vietnamese-American actress Hong Chau as the one-legged Ngọc Lan Tran, who enters the film halfway through, is the real star. She is the one with a full story of human experience and largely takes over the focus of the film with her lofty personal journey. Sporting a thick accent and the resolute jokes about her outsider status, not only in America, but as someone made small against her will, she bucks the usual narrative of the other characters. 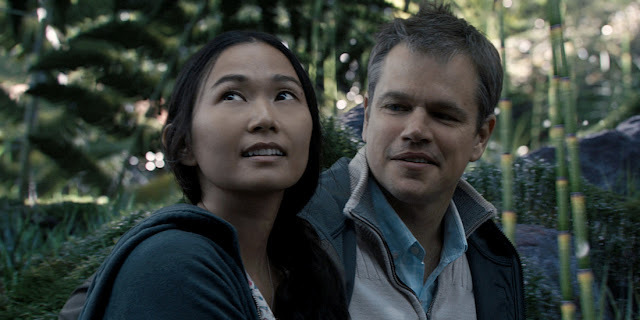 Chau's chemistry with Damon as the de facto romantic lead is strange but mostly compelling due to her undeniable charisma and screen presence, but the whole thing remains entirely problematic thanks to the story being controlled by the vision of white men. Her genuine performance and reverence for the material makes the wholly troubling characterization almost acceptable with her energy and delicate portrayal. In comparison to Paul, Ngọc Lan is made so heroic and worthy despite her stature. Early appearances by comedians Kristen Wiig and Jason Sudeikis quickly fade away as soon as Damon actually shrinks down to reveal a more serious plot about human waste and consumption on Earth. Paul's hard partying European neighbours, inexplicably played by Christoph Waltz and Udo Kier, soon give way to more serious acts of ensuring the survival of our species. Payne and his writing/producing partner Jim Taylor explore problematic ideals of activism and unintended consequences. Paul continually screws things up in his life despite being a good person always trying to do the right thing and be good to others. His is the story of the baseline white man dissatisfied by the lot in his life. The process of "downsizing" leaves Paul almost worse off than before through a series of setbacks where he simply cannot attain the American dream through no real fault of his own. By only surface-level mocking slacktivism or wealth inequality and only superficially caring for issues like overpopulation and the environment through menial acts taken to the extreme, Downsizing becomes an entry into that misguided canon. It's really a story where the true activist, a Vietnamese dissident woman, who does nothing but care for others and prefers to live in a ramshackle community of outsiders over the artificial life of luxury, because it feels real compared to any type of planned society. Thus, Damon's Paul quickly becomes an unneeded passenger in the film and its surreal world. 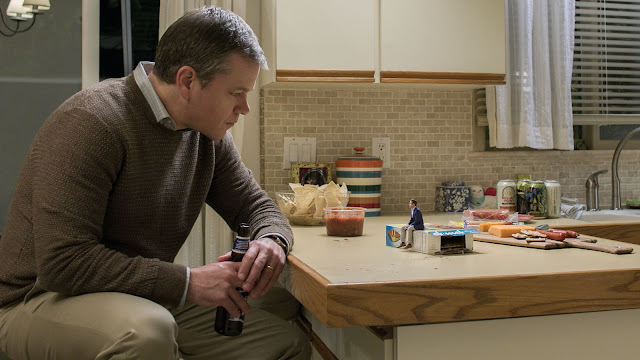 Ultimately, Downsizing is a strange (and very atypical) detour in Payne's filmography of small but meaningful American characters and comedies. Despite its broad premise and early jokes about size and wealth, it's really an ambitious (if misguided) story of dreamers looking for alternate paths to greatness or meaning. The whole shrinking idea becomes so inessential and largely disregarded as soon as the themes of human consumption and extinction make themselves prevalent. It's a worthy yet not nearly satisfying enough and entirely overstuffed film about such big ideas that never amounts to the size of their ambitions. However, Payne really does go for it in a big way.